For those of you who’ve made (or plan on making) Barb’s Bailey’s Irish Cream you might be wondering what else you can put all that yumminess in. Well here’s a recipe for you. An easy, moist, delicious, crowd pleasing Bailey’s Irish Cream Cake. First I thought I would take my Black Russian cake recipe and substitute my homemade Irish cream for the vodka/kahlua. I had a box of yellow cake mix, but only had vanilla instant pudding in the cupboard and not chocolate. No problem, I knew there was an equally good rum cake that’s similar so I quickly looked on the internet and came across a recipe on Allrecipes.com for Irish Cream Bundt Cake. It’s almost the same as the rum cake recipes all over the internet and I’ve added those options in the recipe below. Unfortunately, having cake in my house is not a good idea for any period of time. After I’ve had the first piece for some odd reason I seem to continue eating it and nothing else. I have such a sweet tooth! So after I had a piece I marched the cake down the street and shared with the neighbors. Everyone loved it. Well, everyone except perhaps Joyce who only eats cake if it’s topped with mounds of buttercream (love ya Joyce!). 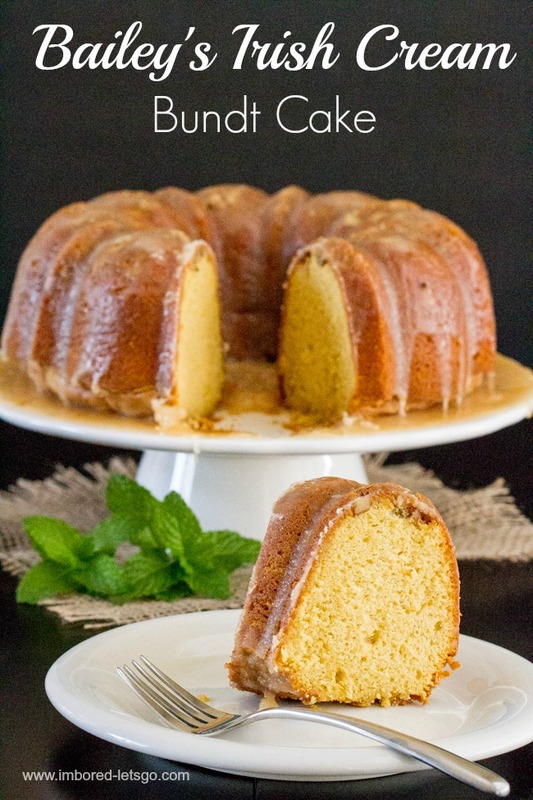 If you’re looking for a super simple, moist cake, I encourage you to give this Bailey’s Irish Cream bundt cake a try! Preheat oven to 325 degrees. Grease/flour bundt pan, then sprinkle nuts over bottom of pan. In large bowl, combine cake mix, pudding, eggs, water, oil, Irish cream. Beat for 5 minutes on high, the pour batter over nuts in pan. Bake in oven for about 60 minutes, until toothpick inserted in center comes out clean. Remove from oven, let cool for 10 minutes, then invert on serving platter. Poke holes over cake (I use a skewer). Spoon glaze over cake and let it absorb into cake. In saucepan, melt butter. Add water and sugar and bring to boil. Continue to boil for 5 minutes while stirring constantly. Remove from heat and stir in Irish cream. Be careful, it will steam when adding the Irish cream! 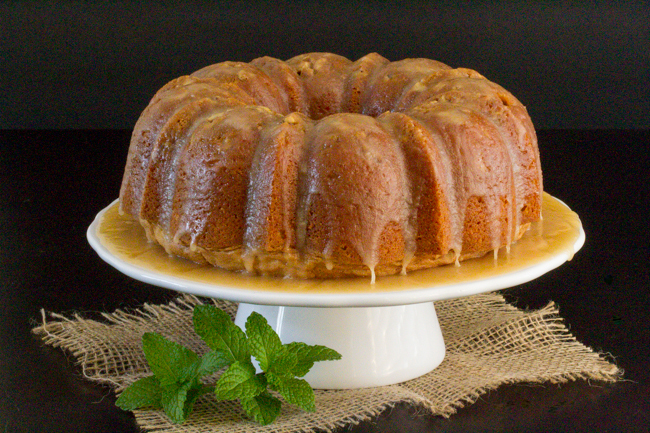 * To make this a rum cake, increase the water to ½ cup and replace the Irish cream with ½ cup of rum. For the glaze, replace the Irish cream with rum. Also, instead of making the glaze, you could always just top the cake with a mixture of powdered sugar and Irish cream for a glaze. I usually use a ratio of 2:1 powdered sugar to liquid. This one goes right to my Irish heart Judy! But I must admit…. I too could dive head first into a bowl of buttercream frosting just like your friend!!! I’m right in there with the buttercream too Candy!!! I make a very similar cake, only I use white cake mix, no nuts, use a full cup of Irish cream and omit the water, and add in a cup of mini chocolate chips to the batter. My glaze is the simple 2:1 powdered sugar:Irish cream. It is by far the biggest hit I have ever made as a cake. That sounds fantastic, thanks for sharing! I’m going to try your version next time! This sounds amazing!! Could i leave out the pecans? Don’t see any reason why you couldn’t! So I made this cake last night and it tastes heavenly!! The only thing was that the bottom was a nice golden yellow and the top was dark, almost burned and I’m not sure why. Had it on the right temperature and greased the bundt pan with butter and then flower. I baked for an hour until the toothpick came out completely clean. Do you have any idea why this may have happened? I’m going to make it again on Friday and want to make sure that doesn’t happen again. Hi Nicole, glad you liked the flavor but sorry to hear the top turned out so dark for you. I’m not really sure why that would be, unfortunately, I’m not an expert baker 🙁 Maybe it has something to do with the oven rack to close to the heat source? I’m so sorry I can’t be more helpful. No that probably is the problem. Doing so many things during the day I didn’t even think to centre the baking rack before I made the cake! I feel so silly now lol. Thank you for replying! The cake is awesome! Let’s hope that solves your problem! Enjoy.! I posted two days ago about making this cake and it tasting great but was too dark. I tried moving the rack a little higher in the oven and that made the difference! I wish I could post a picture of how it came out because I’m so happy! Thank you again! I look forward to trying other recipes! Thank you for reporting back! Happy to hear the rack level was the problem. Need to know if I can use Irish cream instead of the liqueur ,or can I use whiskey instead..
Isn’t Irish Cream a liqueur? You can certainly use the store bought version instead of homemade. If you want to use whiskey, try following the instructions that I included for making this a rum cake and substitute whiskey. I’ve never tried that but I’m sure it would be delicious! I really want to make this for St. Patrick’s Day. However, I want to do it in mini bundt pans and put them on a three tiered cake plate I just bought during an uncontrolled shopping spree. I imagine it would work fine in the mini pans and just the cooking time would need to be adjusted. Thoughts? Suggestions? I think that sounds really cute… share a picture if you make it. I don’t see why it wouldn’t work, just keep an eye on the baking time. If I made this into a cupcake how long will the cooking time be? I’ve never tried making these into cupcakes so I couldn’t tell you… typically cupcakes take 15-20 minutes to bake…suggest you try that, then keep an eye on them if they need more time. I’d like to make this cake, four days ahead of time. Is that possible and if so, how would I store it? I have never tried that so I hesitate to tell you what to do but I’d guess you might want to freeze it then defrost the day you want to serve it. Please could you tell me in grams , how much yellow cake mix. I can’t seem to find the answer. I don’t use grams but according to google if you convert a standard box of cake mix that is 15.25 oz. you get 432.33 grams. Does that help? Thank you so much for this recipe. This cake is so simple to make & not to mention delicious. It only lasted (3) days & it’s just myself & my hubby.